Why Are So Many People Running For President? : It's All Politics Only one person can win the presidency in 2016, and some of the 22 running have scant chance of victory. So why are they in the race? Many hope luck is on their side, but some might have other goals. Republican presidential candidates Jim Gilmore, Lindsey Graham, Bobby Jindal and Rick Perry participate in a pre-debate forum Aug. 6 in Cleveland. 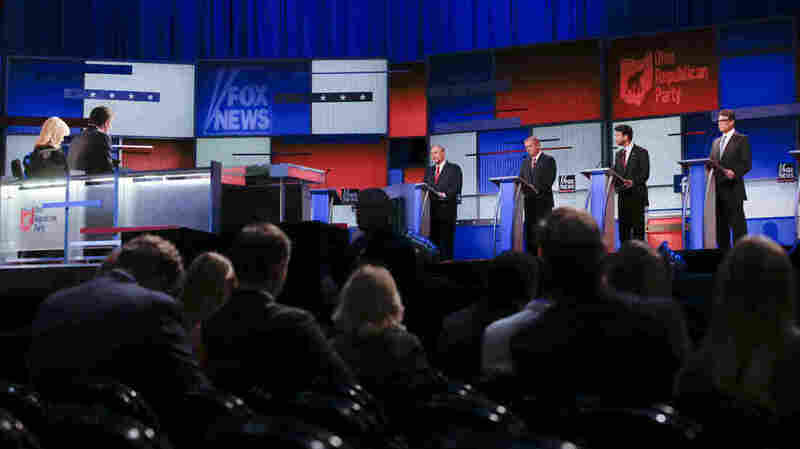 The event gave airtime to seven candidates whose polling numbers were below a top-ten cutoff Fox News set to participate in the main debate. 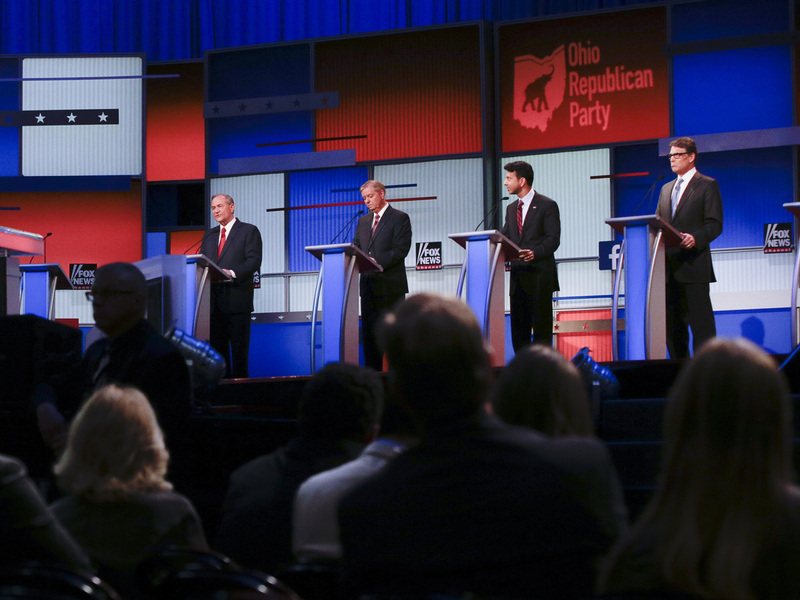 With no incumbent president running, the race is wide open — which GOP pollster Kristen Soltis Anderson says makes a lot of people believe they have a chance. "Running for president is a particularly unpleasant experience, and you really have to believe that you have a shot in order to subject yourself to the process," she says. You also have to be able to sell voters on your commitment to the job. Ted Kennedy, the late senator from Massachusetts, when questioned by CBS journalist Roger Mudd in 1979, famously struggled to explain why he was considering a run for the Democratic nomination. That misstep overshadowed his campaign, and likely contributed to his loss to former President Jimmy Carter in the 1980 primary. Former Minnesota Gov. Tim Pawlenty was the first major candidate to drop out of the race for the 2012 Republican nomination. He says some hopefuls are drawn in because they believe their message might catch fire with voters. "There may be some candidates who are viewed as less serious, but hopeful that they might be able to replicate what Jimmy Carter did long ago, or Bill Clinton did long ago — who were people who weren't well-known at the time, but they did sort of catch lightning in a bottle," Pawlenty says. Others may realize that their chances of winning are slim, but run to bring attention to a particular issue or ideology. Chris Ellis, a political scientist at Bucknell University, points to Vermont Sen. Bernie Sanders, an independent running for the Democratic nomination on a platform attacking economic inequality. Ellis also notes the campaign of Sen. Rand Paul of Kentucky — like his father Ron Paul's in 2008 and 2012 — is promoting libertarian ideas. Even though it's grueling, Ellis says for some people, campaigning for president can be fun. "I think anyone who runs for president has a little bit of Donald Trump in them," Ellis says, "in that they sort of like the attention, want to be famous, even if it's just to advance policy goals." Sometimes, as the field gets bigger, more potential candidates think they might as well run, too. Mo Elleithee, a former Democratic National Committee spokesman who now leads Georgetown University's Institute of Politics and Public Service, calls it the "Why Not Me?" reason. "[They think], 'I can't believe that yahoo is running — if that yahoo can run, then why not me?' " Elleithee says. "It makes them believe that they can. Sometimes legitimately so, sometimes delusionally so." Even if they know they're unlikely to win, some candidates may also have their eyes on consolation prizes. At best, they could land a vice presidential slot, or like Hillary Clinton after her failed 2008 bid for the Democratic nomination, a prominent cabinet post — positions that can increase their visibility and bone fides for another run in the future. Sometimes presidential hopefuls can cash in on their modest success. Former Arkansas Gov. Mike Huckabee, who's running again this year, wound up with his own Fox News show after his unsuccessful bid for the Republican nomination in 2008. While the campaign didn't have the outcome Huckabee had hoped for, he's done much better financially since running for the White House than he had before then. But Pawlenty says that such a career plan has its limits: "I don't think Fox News, for example, needs 17 more commentators."